Tag line: "Every year brings a great movie. Every decade a great movie musical!" Alan Parker’s Bugsy Malone helped get me through a very difficult time. It was 1981 - about a month shy of my 12th birthday - and I had to go into the hospital for minor ear surgery. Because the operation was scheduled for early morning, I checked in the day before and stayed overnight. What’s more, the hospital was a good 20 miles from home, so when visiting hours were over and my parents left for the day, I felt incredibly alone. I passed the time re-reading one of my favorite comic books (which I still have: Batman’s Detective Comics, #476, “The Sign of the Joker”), then turned my attention to the TV hanging above my bed. After watching the latest episode of a short-lived sitcom titled Best of the West (anyone out there remember that one? 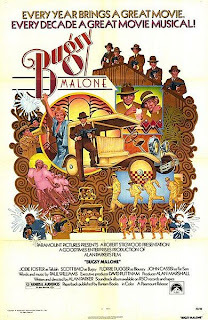 ), it was time for the Movie of the Week, which just happened to be Bugsy Malone, a fun, upbeat musical starring a bunch of kids (most of whom were around my age), all acting like mobsters and “shooting” each other with whipped cream. A few minutes into the film, I forgot that I was so far from home, forgot my upcoming surgery … forgot everything! At that moment, Bugsy Malone was exactly what I needed. Set in the Roaring ‘20s during the days of Prohibition, Bugsy Malone tells the story of… well... Bugsy Malone (Scott Baio), a down on his luck boxing promoter who falls in love with singer Blousey Brown (Florrie Dugger). Things get a bit dicey, however, when Tallulah (Jodie Foster), the girlfriend of a gangster named Fat Sam (John Cassisi), also falls for Bugsy. But there’s more to Bugsy Malone than romantic entanglements; the film features a gangland-style turf war as well, with Fat Sam, owner of the most popular Speakeasy in town, facing off against his rival, Dandy Dan (Martin Lev), who’s trying to muscle in on Sam’s territory. To gain the upper hand, Dan acquires a brand-new weapon called a splurge gun, which coats its victims with whipped cream. Out-muscled and outgunned, Sam has no choice but to turn to Bugsy Malone for help. For what would be his first feature-length motion picture, director Alan Parker wanted to make a movie his four children would enjoy, and it was his eldest son who suggested a film starring only kids. Bugsy Malone is certainly unique in that regard; the entire cast was under the age of 17 when it was made, yet the world they inhabit is very adult-like, with Speakeasies, cars (powered by foot pedals, not gasoline) and gun-toting gangsters. Of course, the guns they carry fire whipped cream instead of bullets, but that only made them more awesome (after seeing this movie, I desperately wanted one of those guns). The whole picture has a whimsical feel to it, and even the musical numbers, many of which were performed by singer / songwriter Paul Williams (his voice was dubbed over that of the kids), are playful and amusing (“Fat Sam’s Grand Slam” is a real toe-tapper). 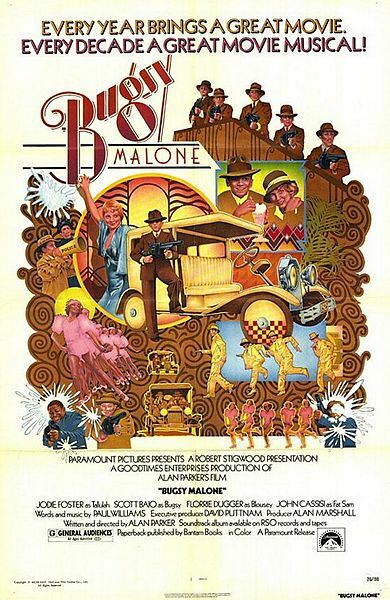 While I’ve seen bits and pieces of Bugsy Malone over the years, this was the first time I sat down and watched the entire movie, start to finish, since that night in 1981. Yes, it’s silly, and oh so strange (especially whenever Paul Williams’ voice comes bellowing out of a young kid’s mouth). But Bugsy Malone is the film that saw me through a dark, lonely evening, and because of that it will forever hold a special place in my heart. Interestingly enough, I encountered Bugsy Malone under similar circumstances, and found its absurdity to be just the right thing to keep my hopes up, mostly because of its bizarre nature. The closing musical number proved to be quite beautiful in relation to the rest of the film, although I am still a bit unsure about what to make of all the pie tossing.